Velas Resorts in Mexico have once again been recognized among the best in the world in TripAdvisor’s 2019 Travelers’ Choice Awards. Velas Resorts in Mexico have once again been recognized among the best in the world in TripAdvisor’s 2019 Travelers’ Choice Awards. Cited by reviewers as “immaculately maintained and stunningly beautiful,” “perfect,” the “Most Luxurious All Inclusive Ever!,” and having “everything from food to service…top notch,” among many other things, the Mexico resorts have been noted in the Awards consecutively for the past seven years. Only the top 1% of all hotels on TripAdvisor, the world’s largest travel site with 702 million reviews and opinions covering the world's largest selection of travel listings worldwide, are featured in its awards. Velas Resorts’ five all-inclusive properties, located in Los Cabos (TripAdvisor rated No.1 in the destination), Riviera Maya (among the top 5 on TripAdvisor in the destination), Riviera Nayarit (TripAdvisor rated No.1 in the destination), and Puerto Vallarta (among the top 5 on TripAdvisor in the destination), have earned numerous prestigious international awards for their services and facilities, among them Virtuoso’s “Best Spa” and Forbes’ “Coolest All-Inclusives” among others. In December 2018, the collection opened its only European Plan offering, Mar del Cabo, a boutique hotel on Mexico’s Baja Peninsula. For more information on Velas Resorts or to make a reservation, please call 1-888- 407-4869 or visit http://www.velasresorts.com. 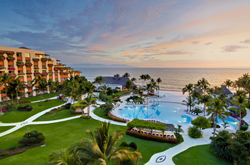 Velas Resorts in Riviera Maya, Puerto Vallarta, Riviera Nayarit and Los Cabos have earned 52 AAA Diamonds, including the prestigious Five Diamond Award. Other esteemed international awards for their services and facilities include Virtuoso’s “Best Spa,” Forbes’ “Coolest All-Inclusives,” Forbes’ Four Star Award, and TripAdvisor’s Hall of Fame, among others. Offering unparalleled all-inclusive experiences, properties include the AAA Five Diamond Grand Velas in Los Cabos, with dramatic ocean views and unique spaces infusing every area of the resort; AAA Five Diamond Grand Velas Riviera Nayarit, which enjoys a privileged natural setting with flowering, landscaped gardens beside a long stretch of pristine beach and a dramatic backdrop of the Sierra Madre mountains; and AAA Five Diamond Grand Velas Riviera Maya, located five minutes from Playa del Carmen, offering a sophisticated all-inclusive resort experience in the Caribbean with jungle and beach settings. In Puerto Vallarta, Casa Velas is a boutique adults-only hotel and ocean club located on the Marina Vallarta Golf Course, and Velas Vallarta, a family-friendly all suites resort and spa located on Banderas Bay. Mar del Cabo, a boutique hotel on Mexico’s Baja Peninsula, opened on December 5th as its only European Plan offering. Eduardo Vela Ruiz, founder and president of Velas Resorts, operates Velas Resorts with brother Juan Vela, vice president of Velas Resorts, by his side. For reservations or more information, call 1-888-407-4869, email reservations(at)velasresorts.com or visit https://www.velasresorts.com.